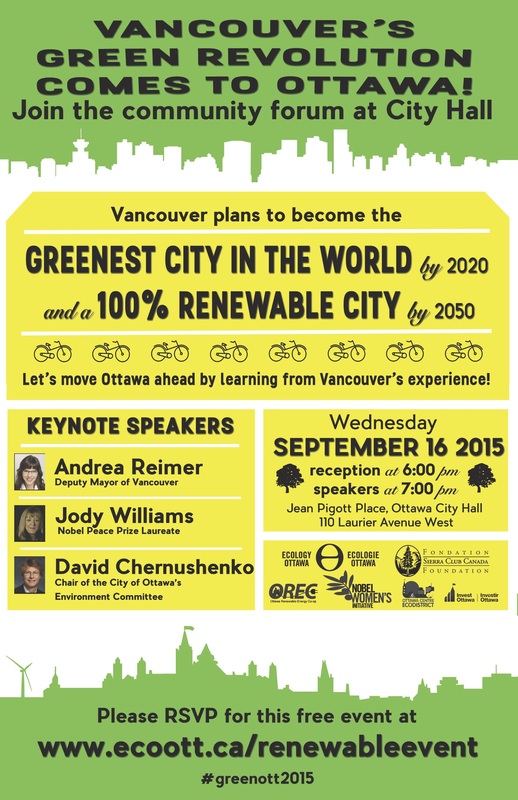 Vancouver’s Green Revolution Comes to Ottawa! Andrea Reimer, Deputy Mayor of Vancouver and one of the most progressive environmental voices in Canadian municipal politics, speaks about Vancouver’s strategy to become the Greenest City in the world by 2020 and a 100% Renewable City by 2050. She will be joined by Jody Williams, Nobel Peace Prize Laureate, who advocates for environmental and social justice; and by David Chernushenko, the City of Ottawa’s Chair of Environment Committee, who will reflect on our city’s renewable energy strategy. Click here to RSVP and reserve your seat! Doors open at 6pm for refreshments, networking, and info booths – proceedings start at 7pm.